Tena Lady Pants Plus are breathable pants designed for women with moderate to heavy incontinence. The pants are designed in a subtle, light colour for a feminine feel. Tena Lady Pants Plus are tailor-made to provide a body-close fit, ensuring maximum discretion. The addition of dual leakage barriers ensures maximum absorption so you can relax without the worry of any leaks throughout the day. Tena Lady Pants Plus provide a body close fit for outstanding comfort and feature a narrow waistband to ensure the product fits accurately around your waist. With a thin core adapted for the female anatomy, the product is specially designed to fit comfortably around a woman’s body. 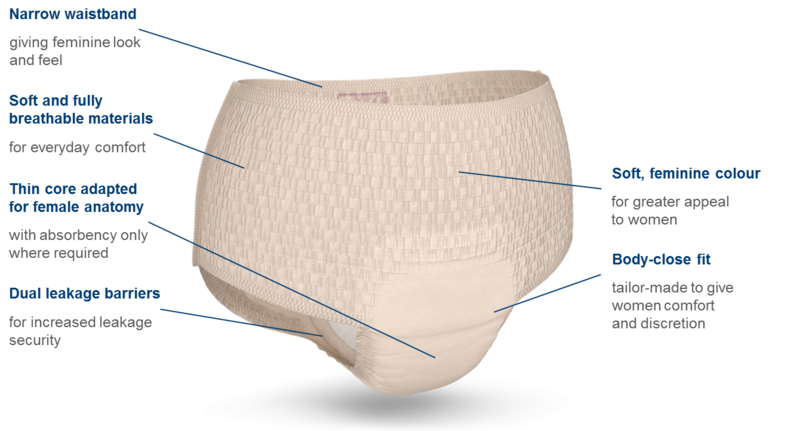 The material of the pants is soft and gentle on the skin, providing a comfortable feel. As the material is fully breathable, you can be reassured your skin will stay healthy during use. The pants contain special odour control technology so you can enjoy your day without the worry of any unwanted odours. Tena Lady Pants Plus are a perfect solution for women who are looking for a feminine yet highly absorbent product to manage incontinence.